Tons of DVD collectors who happen to be video games lovers are wondering whether PS3 can play DVD. To handle their query, “Can PS3 play DVD”, we need to first figure out what PS3 is. PS3, fully named as PlayStation3, is a home video game console produced by Sony Computer Entertainment. Facing the query, many people hold that PS3 won’t play DVD, but Sony claims that PS3 is able to play DVD on it. Yes, it is true that PS3 can play DVD. However, if you continually play back DVD discs on PS3, the PS3 DVD drive might be harmed or ,even worse, damaged. Also, carrying DVD discs brings so much inconvenience to PS3 users. What’s more, enduring many times of in and out the DVD drive, the DVD discs are subject to being scratched surfacely, which poses a great threat to those DVD collectors. All those factors combined make ripping or converting DVD to PS3 recognized video formats necessary though PS3 can directly play DVD. By ripping or converting DVD to PS3 recognized video formats, you can not only watch DVD on PS3, but can also protect DVD discs from being scratched due to in and out the PS3 DVD drive again and again. In other words, you are creating a safe PS3 DVD player by doing so. To convert DVD to PS3, you need to download and install DVD to PS3 converter software. However, there is an undeniable fact that commercial DVDs are generally encrypted. For example, Disney DVDs are under Disney Copy Protection, and other commercial DVDs are under Data Rights Management, better known as DRM. It is quite a task to find a right DVD to PS3 converter that is able to decrypt copy-protected DVDs. But if you happen to read this article, you’re a lucky dog for in this article I will recommend a powerful program to rip both homemade DVDs and copy-protected DVD to PS3 recognized video formats with just a few mouse clicks. Unlike many DVD to PS3 converters only able to rip non-encrypted DVDs to other video formats, Leawo DVD Ripper is a powerful DVD to PS3 converter that is able to decrypt copy-protected DVDs thanks to its advanced technology. Leawo DVD Ripper can convert DVD to video in many formats like MP4, AVI and WMV fit for PS3 with utmost video quality, regardless of DVD copy protections. During the conversion process, you can directly choose device name such as iPhone, iPad and in this case PS3 as output device, which save time and energy used to set other parameters like Video and Audio Codec, quality, Bitrate, Resolution, Frame Rate, Sample Rate, Aspect Ratio and Channel. Those parameters will smartly match your device chosen. You can freely download and install DVD to PS3 Converter either in Windows Version or Mac Version. When the installation is completed, launch the DVD to PS3 converter and kick off the conversion journey by following the steps below. Insert a DVD disc into the DVD drive, and then click “Add Blu-ray/DVD” button on the main interface to import source DVD. You can also add source DVD from DVD folder on your computer. Note: When source DVD is done importing, you can choose a mode to convert from 3 modes: Full Movie, Main Movie and Custom Mode. Full movie mode would load all source DVD content and Main Movie mode would only load the longest chapter while you can choose whatever chapter you would like to load in Custom Mode. Click the drop-down list “MP4 Video” by default on the left of green “Convert” button on the right-top, choose “Change”, and a Profile editing panel will pop up. Here I am to introduce two different methods to set output format. Note: The drop-down list is named “MP4 Video” by default, but if you have changed the output video formats into others, the drop-down list will display the according name. 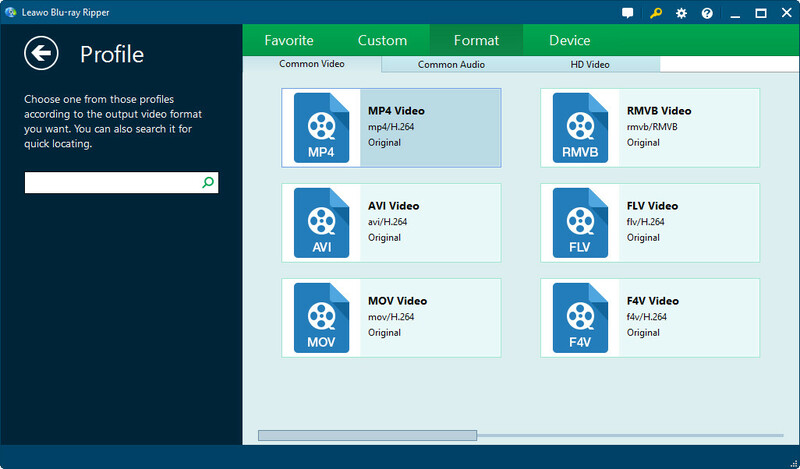 For example, if you have set AVI as output video format, you will see the drop-down list display “AVI Video” when you launch Leawo DVD Ripper next time. The first method is that you can directly choose PS3 as output device. 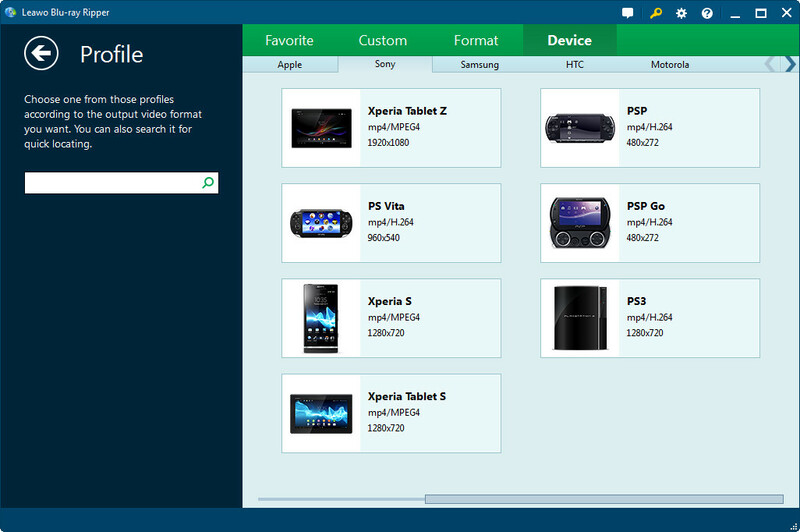 On the popup interface, click “Device> Sony> PS3” to choose the exact device. In this case, other parameters will smartly match the device chosen. 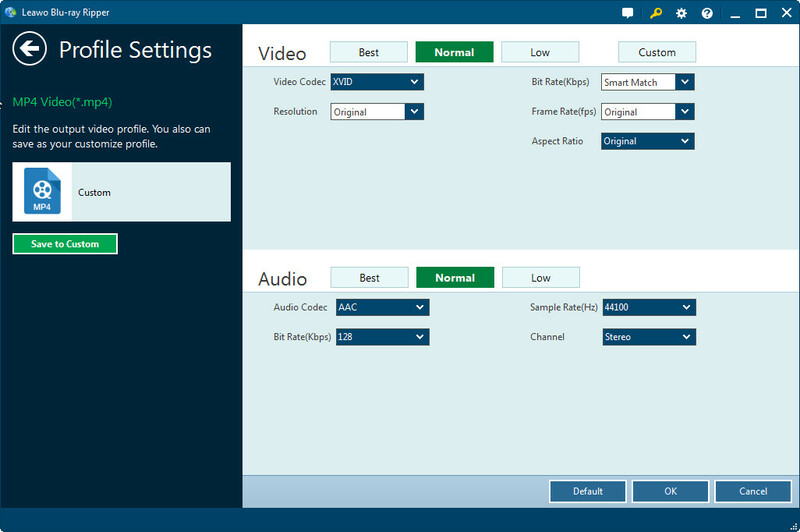 The second method is that you can firstly set output video format, then adjust detailed parameters. Click “Format” to choose output video format. For example, you can choose MP4 as PS3 supports this video format. Then you shall edit detailed parameters like Video and Audio Codec, quality, Bitrate, Resolution, Frame Rate, Sample Rate, Aspect Ratio and Channel. Finally, press “OK” button to save the setting. Click the green “Convert” button on the main interface, and you will see a popup panel where you can select the Destination Folder to Save the Converted PS3 Video. After the selection, you can click “Convert” button at the bottom of the popup panel to start the conversion process. 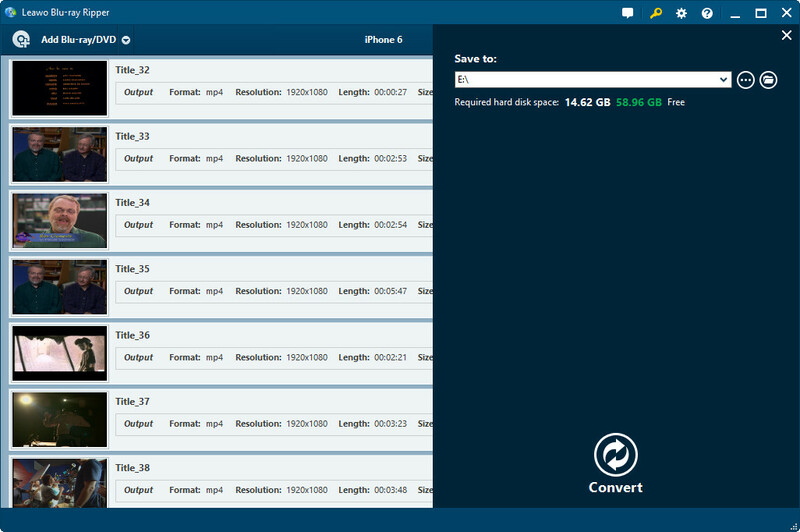 After conversion begins, you can view or pause conversion process on the main interface. Here is a simple step by step guide for transferring or watching video files onto your PS3 using a USB flash drive or an external hard drive. Step 1: Plug a USB flash drive or an external hard drive into your computer and copy over the converted video files that you want to watch on your PS3. Step 2: After the copying process is done, pull out the USB flash drive or the external hard drive from your computer and then plug it into one of the USB ports on the PS3. 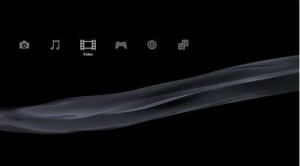 Step 3: Navigate to “Video” on the PS3 XMB menu and find your device, hit triangle to view all contents and select the file you want and either copy it to the PS3 hard drive or just play it directly from the connected device. By following the guidance above, you can achieve your goal of more safely and conveniently playing DVD on PS3 or watching DVD on PS3 for protecting either PS3 DVD drive or your precious DVD discs from being scratched.